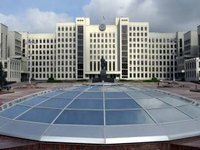 The OSCE on Saturday 20 released the original version of the Memorandum on the fulfillment of the protocol on the results of consultations of the trilateral contact group about the steps towards implementation of the peace plan of Ukrainian President Petro Poroshenko and initiatives of Russian President Vladimir Putin. According to the document, to fulfill point 1 of the protocol dated of September 5, participants of the trilateral contact group made up of representatives of Ukraine, Russian Federation and Organization for Security and Cooperation in Europe, as well as representatives of certain districts of the Donetsk and Luhansk regions, reached an understanding regarding the following measures called to seal the bilateral ceasefire agreement. 1. The ceasefire is to be considered mutual. 2. Subdivisions and military formations of the sides along are to stop in their juxtaposition as of September 19, 2014. 3. There is a ban on the use of all types of weapons and any form of offensive action. 4. Within 24 hours after the approval of this memorandum, all lethal weapons more than 100 millimeter caliber are to be moved back from juxtaposition by at least 15 kilometers (with the exception of those indicated below), including from residential areas, which will allow to create a zone from use of weapons of no less than 30 kilometers in width (the safety zone). 100 mm MT12 canons - by 9 kilometers; 120 mm mortars - by 8 kilometers; 122 mm howitzers D30 (2S1 Gvozdika - by 16 kilometers; 152 mm 2C5 Giatsint-S (2C3 Acacia, 2C19 Mcta-C, 2A65 Mcta-B) - by 33 kilometers; Multiple Rocket Launch System (MRLS) 9K51 Grad - by 21 kilometers, 9K57 Uragan - by 36 kilometers; 9K58 Smerch - by 70 kilometers; MRLS Tornado-G - by 40 kilometers; MRLS Tornado U - by 70 kilometers; MRLS Tornado-C - by 120 kilometers; tactical rocket systems - by 120 kilometers. 5. A ban is to be introduced on deployment of heavy weapons and military equipment in the district limited by the towns of Komsomolske, Kumachove, Novoazovsk, Sakhanka, with OSCE monitoring. 6. A ban is to be introduced on installment of new mines and explosive barriers within the limits of the safety zone. There is an obligation to dismantle previously installed mines and explosive barriers in the safety zone. 7. A ban from the moment of approval of this memorandum is to be introduced on flights of military aviation and foreign drones, with the exception of drones used by the monitoring mission of OSCE, along the line of juxtaposition in the weapons-free zone of 30 kilometers width. 8. The OSCE monitoring mission made up of observers of the organization is to be deployed to the cease-fire zone within 24 hours from the moment of approval of this memorandum. The abovementioned zone should be divided into sectors, the number and limits of which should be agreed in the course of preparation of the OSCE monitoring mission for work. 9. All foreign militarized formations, military equipment and militants and mercenaries are to exit the territory of Ukraine under OSCE monitoring. Participants of the trilateral contact group: OSCE Ambassador Heidi Tagliavini, Second President of Ukraine Leonid Kuchma, Ambassador of Russian Federation to Ukraine Mikhail Zurabov, chairman of the Donetsk People's Republic Alexander Zakharchenko and chairman of Luhansk People's Republic Ihor Plotnitsky. The document is dated September 19.